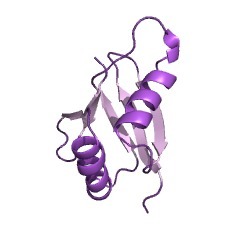 Phox and Bem1p domain, present in many eukaryotic cytoplasmic signalling proteins. 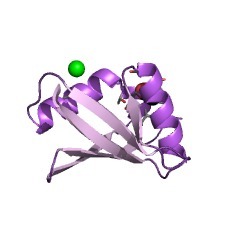 The domain adopts a beta-grasp fold, similar to that found in ubiquitin and Ras-binding domains. 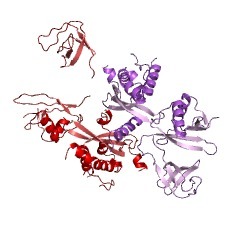 A motif, variously termed OPR, PC and AID, represents the most conserved region of the majority of PB1 domains, and is necessary for PB1 domain function. 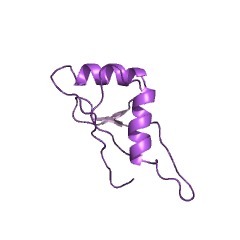 This function is the formation of PB1 domain heterodimers, although not all PB1 domain pairs associate. 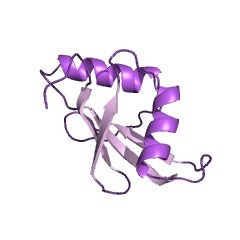 The PB1 (Phox and Bem1) domain, comprising about 80 amino acid residues, is conserved among animals, fungi, amoebas, and plants. 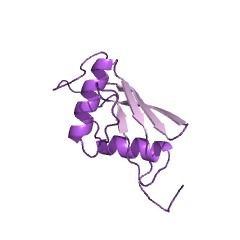 It functions as a protein binding module through PB1-mediated heterodimerization or homo-oligomerization [(PUBMED:17726178), (PUBMED:15590654), (PUBMED:11483498), (PUBMED:24706860)]. 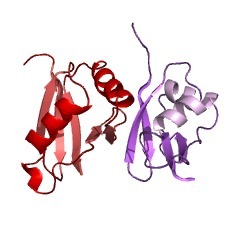 The PB1 domains adopt an ubiquitin-like beta-grasp fold, containing two alpha helices and a mixed five-stranded beta sheet. The beta-sheet has a convex surface, and alpha1 fits into the cavity formed by the sheet. PB1 domains may display an acidic surface (type I), a basic surface (tape II), or both surfaces (type I/II) on opposite faces of the domain structure to allow for front-to-back orientation of multiple PB1 domains [(PUBMED:17726178), (PUBMED:15590654), (PUBMED:11483498), (PUBMED:24706860), (PUBMED:24710426)]. There are 11243 PB1 domains in 11222 proteins in SMART's nrdb database. Taxonomic distribution of proteins containing PB1 domain. This tree includes only several representative species. The complete taxonomic breakdown of all proteins with PB1 domain is also avaliable. Click on the protein counts, or double click on taxonomic names to display all proteins containing PB1 domain in the selected taxonomic class. 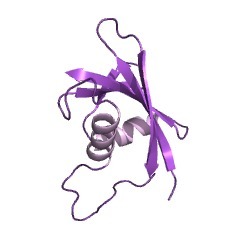 MEK5, a new target of the atypical protein kinase C isoforms in mitogenicsignaling. The MEK5-extracellular signal-regulated kinase (ERK5) tandem is a novelmitogen-activated protein kinase cassette critically involved in mitogenicactivation by the epidermal growth factor (EGF). 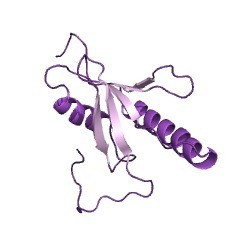 The atypical proteinkinase C isoforms (aPKCs) have been shown to be required for cell growthand proliferation and have been reported to interact with the adapterprotein p62 through a short stretch of acidic amino acids termed the aPKCinteraction domain. 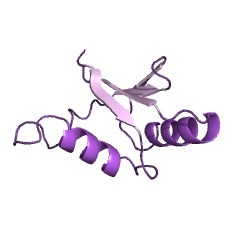 This region is also present in MEK5, suggesting thatit may be an aPKC-binding partner. Here we demonstrate that the aPKCsinteract in an EGF-inducible manner with MEK5 and that this interaction isrequired and sufficient for the activation of MEK5 in response to EGF.Consistent with the role of the aPKCs in the MEK5-ERK5 pathway, we showthat zetaPKC and lambda/iotaPKC activate the Jun promoter through theMEF2C element, a well-established target of ERK5. From all these results,we conclude that MEK5 is a critical target of the aPKCs during mitogenicsignaling. 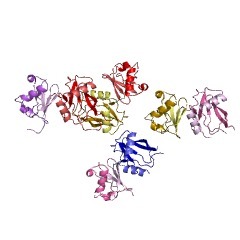 Novel modular domain PB1 recognizes PC motif to mediate functionalprotein-protein interactions. Modular domains mediating specific protein-protein interactions playcentral roles in the formation of complex regulatory networks to executevarious cellular activities. Here we identify a novel domain PB1 in thebudding yeast protein Bem1p, which functions in polarity establishment,and mammalian p67(phox), which activates the microbicidal phagocyte NADPHoxidase. Each of these specifically recognizes an evolutionarily conservedPC motif to interact directly with Cdc24p (an essential protein for cellpolarization) and p40(phox) (a component of the signaling complex for theoxidase), respectively. Swapping the PB1 domain of Bem1p with that ofp67(phox), which abolishes its interaction with Cdc24p, confers on cellstemperature- sensitive growth and a bilateral mating defect. Thesephenotypes are suppressed by a mutant Cdc24p harboring the PCmotif-containing region of p40(phox), which restores the interaction withthe altered Bem1p. This domain-swapping experiment demonstrates that Bem1pfunction requires interaction with Cdc24p, in which the PB1 domain and thePC motif participate as responsible modules. Structure and ligand recognition of the PB1 domain: a novel protein modulebinding to the PC motif. 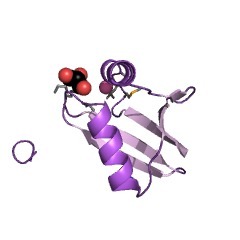 PB1 domains are novel protein modules capable of binding to targetproteins that contain PC motifs. 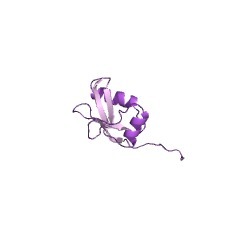 We report here the NMR structure andligand-binding site of the PB1 domain of the cell polarity establishmentprotein, Bem1p. In addition, we identify the topology of the PCmotif-containing region of Cdc24p by NMR, another cell polarityestablishment protein that interacts with Bem1p. The PC motif-containingregion is a structural domain offering a scaffold to the PC motif. 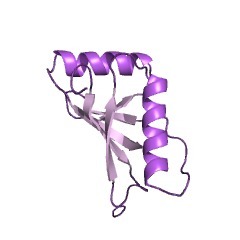 Thechemical shift perturbation experiment and the mutagenesis study show thatthe PC motif is a major structural element that binds to the PB1 domain. 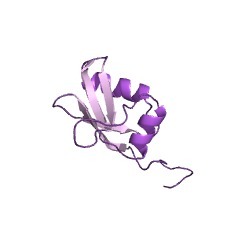 Astructural database search reveals close similarity between the Bem1p PB1domain and the c-Raf1 Ras-binding domain. However, these domains arefunctionally distinct from each other. 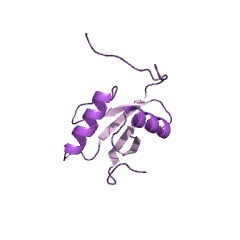 The atypical protein kinase Cs. Functional specificity mediated byspecific protein adapters. 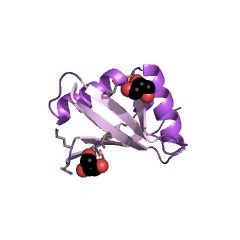 Since its discovery more than 10 years ago, the atypical PKC (aPKC)subfamily has attracted great interest. A number of reports have shownthat the kinases of this subfamily play critical roles in signalingpathways that control cell growth, differentiation and survival. 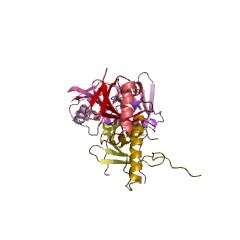 Recently,several investigators have identified a number of aPKC-interactingproteins whose characterization is helping to unravel the mechanisms ofaction and functions of these kinases. These interactors include p62,Par-6, MEK5 and Par-4. The details of how these adapters serve to link theaPKCs to different receptor signaling pathways and substrates in responseto specific stimuli are crucial not only for developing an understandingof the roles and functions of the aPKCs themselves, but also for moregenerally establishing a view of how specificity in signal transduction isachieved. The PC motif: a novel and evolutionarily conserved sequence involved ininteraction between p40phox and p67phox, SH3 domain-containing cytosolicfactors of the phagocyte NADPH oxidase. 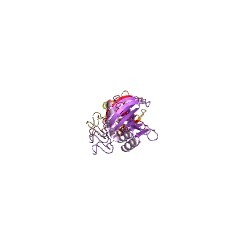 The superoxide-generating NADPH oxidase, dormant in resting phagocytes, isactivated during phagocytosis following assembly of themembrane-integrated protein cytochrome b558 and cytosolic factors. 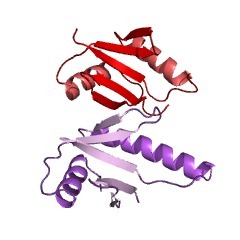 Amongthe latter are the three proteins containing Src homology 3 (SH3) domains,p67phox, p47phox and p40phox. While the first two factors areindispensable for the activity, p40phox is tightly associated with p67phoxin resting cells and is suggested to have some modulatory role. Here wedescribe a systematic analysis of the interaction between p40phox andp67phox using the yeast two-hybrid system and in vitro binding assays withrecombinant proteins. Both methods unequivocally showed that the minimumrequirements for stable interaction are the C-terminal region of p40phoxand the region between the two SH3 domains of p67phox. This interaction ismaintained even in the presence of anionic amphiphiles used for theactivation of the NADPH oxidase, raising a possibility that it mediatesconstitutive association of the two factors in both resting and activatedcells. 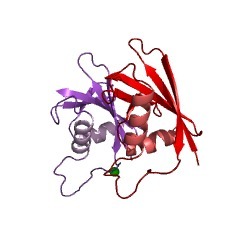 The C-terminal region of p40phox responsible for the interactioncontains a characteristic stretch of amino acids designated as the PCmotif, that also exists in other signal-transducing proteins from yeast tohuman. Intensive site-directed mutagenesis to the motif in p40phoxrevealed that it plays a critical role in the binding to p67phox. 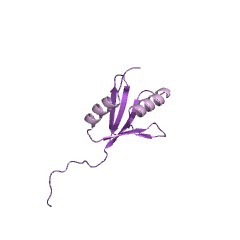 Thus thePC motif appears to represent a novel module for protein-proteininteraction used in a variety of signaling pathways. Novel domains in NADPH oxidase subunits, sorting nexins, and PtdIns3-kinases: binding partners of SH3 domains? 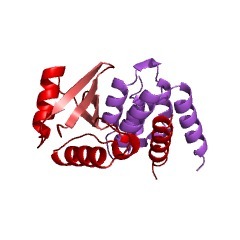 Two SH3 domain-containing cytosolic components of the NADPH oxidase,p47phox and p40phox, are shown by analyses of their sequences to containsingle copies of a novel class of domain, the PX (phox) domain. Homologousdomains are demonstrated to be present in the Cpk class ofphosphatidylinositol 3-kinase, S. cerevisiae Bem1p, and S. pombe Scd2, anda large family of human sorting nexin 1 (SNX1) homologues. The majority ofthese domains contains a polyproline motif, typical of SH3 domain-bindingproteins. Two further findings are reported. 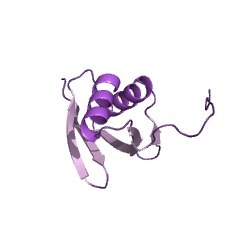 A third NADPH oxidasesubunit, p67phox, is shown to contain four tetratricopeptide repeats(TPRs) within its N-terminal RaclGTP-binding region, and a 28 residuemotif in p40phox is demonstrated to be present in protein kinase Cisoforms iota/lambda and zeta, and in three ZZ domain-containing proteins. Isolation of MEK5 and differential expression of alternatively splicedforms. 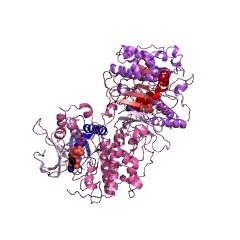 The prototype mitogen-activated protein (MAP) kinase module is athree-kinase cascade consisting of the MAP kinase, extracellularsignal-regulated protein kinase (ERK) 1 or ERK2, the MAP/ERK kinase (MEK)MEK1 or MEK2, and the MEK kinase, Raf-1 or B-Raf. This and other MAPkinase modules are thought to be critical signal transducers in majorcellular events including proliferation, differentiation, and stressresponses. To identify novel mammalian MAP kinase modules, polymerasechain reaction was used to isolate a new MEK family member, MEK5, from therat. MEK5 is more closely related to MEK1 and MEK2 than to the other knownmammalian MEKs, MKK3 and MKK4. 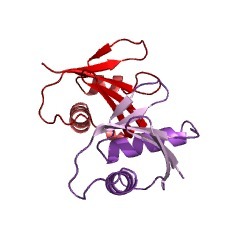 MEK5 is thought to lie in anuncharacterized MAP kinase pathway, because MEK5 does not phosphorylatethe ERK/MAP kinase family members ERK1, ERK2, ERK3, JNK/SAPK, or p38/HOG1,nor will Raf-1, c-Mos, or MEKK1 highly phosphorylate it. Alternativesplicing results in a 50-kDa alpha and a 40-kDa beta isoform of MEK5. 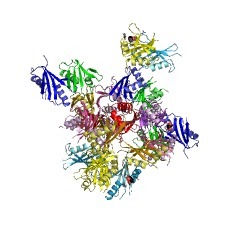 MEK5beta is ubiquitously distributed and primarily cytosolic. MEK5 alpha isexpressed most highly in liver and brain and is particulate. The 23 aminoacids encoded by the 5' exon in the larger alpha isoform are similar to asequence found in certain proteins believed to associate with the actincytoskeleton; this alternatively spliced modular domain may lead to thedifferential subcellular localization of MEK5 alpha. This information is based on mapping of SMART genomic protein database to KEGG orthologous groups. Percentage points are related to the number of proteins with PB1 domain which could be assigned to a KEGG orthologous group, and not all proteins containing PB1 domain. Please note that proteins can be included in multiple pathways, ie. the numbers above will not always add up to 100%.